Dr. Dwight C. Watson, Provost/Vice President for Academic Affairs and Student Affairs. 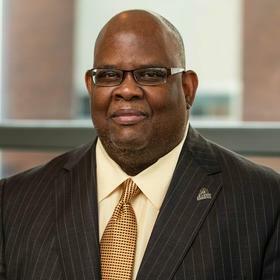 Dr. Dwight C. Watson is currently in the Provost and Vice President of Academic and Student Affairs at Southwest Minnesota State University in Marshall, Minnesota. As Provost and Vice President, he supervises the academic deans and their departments, the Dean of Students and the Associate Vice President of Student Affairs, and the Chief Information Officer. Administrative experiences beyond the daily operations of the Office of the Provost includes budgetary authority, fund raising, national and state governmental relations and advocacy, strategic plan development and implementation, PK-12 collaboration and community partnership relations, international programming and partnerships, collective bargaining agreement negotiations, and state, regional, and national accreditation. Previously, Dr Watson was the dean of the College of Education at the University of Northern Iowa. He guided the leadership of five academic departments, a school of health, physical education, and leisure services, seven academic centers, and a child development center. The College of Education had a 27 million dollar operating budget, 190 faculty and staff, and supported the educational matriculation of close to 4000 students. Dr. Watson’s academic and administrative career included positions at Campbell University in Buies Creek, NC as director of Elementary Programs, Hamline University in St. Paul, MN as chair of the Department of Education, the University of Wisconsin –Eau Claire as the associate dean of Teacher Education and chair of the Departments of Curriculum and Instruction and Foundations of Education. Dr. Watson was a former PK-12 practitioner and administrator, Dr. Watson taught for 15 years at both the elementary and middle grades levels in North Carolina, South Carolina, and Minnesota. Dr. Watson also worked as a central office administration for a large, urban district in Raleigh, NC serving as the Language Arts program director where he supervised the language arts, reading, and writing curriculum and staff development for 64 elementary schools as well as programs for Title I and Reading Recovery. Dr. Watson’s research interests include curriculum integration, children’s literature, and multicultural education and his current academic service activities include numerous local, state, national, and international workshops on his research interests as well as reading and writing literacy. Dr. Watson is an active scholar and continues to publish annually as he mentors junior faculty members in co-conducting research and publishing scholarship. Dr. Watson has amassed a publication record of over 51 peer-reviewed articles, book chapters, book reviews, and news articles; and he has conducted more than 100 local, regional, state, national and international presentations. Dr. Watson received his B.A. and M.Ed in elementary education from the University of South Carolina in Columbia and his Ed.D in curriculum and instruction, with a concentration in reading and writing literacy, from North Carolina State University in Raleigh, NC. Dr. Watson has also continued his leadership development by completing the Millennial Leadership Initiative and the Becoming a Provost Academy which were both sponsored by the American Association of State Colleges and Universities.